THE Maharashtra government has relaxed the criteria for giving aid to families of farmers who have committed suicide. The move comes in the wake of recent media reports that 4,000 farmers’ families in Vidarbha were denied relief on the ground that land was not registered in the name of the deceased. The state-run Vasantrao Naik Sheti Swavalamban Mission issued a circular on June 27 which redefined the term “farmer” to include members of farming families who do not have land in their names. The circular says that if agricultural land is registered in the name of a member of a farming family, suicide by any other member due to agrarian distress will be recognised as farmer suicide and the family would be eligible for aid. 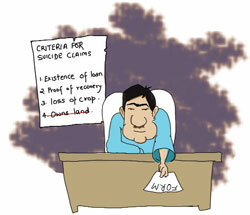 It also calls for revising the list of farmer suicide cases from January 2010 onwards. Parveen Pardeshi, head of the Vasantrao Naik Sheti Swavalamban Mission, says, “At present, the government acknowledges two circumstances for recognising suicide by a farmer. They are: existence of a loan and proof of follow-up for loan recovery, or loss of agriculture crop.” Both these criteria require that the person committing suicide should own agricultural land or be involved in agricultural activity. “Now, the circular says any proof of the deceased being involved in farming activity and having debts or having lost an agricultural crop would be sufficient to recognise the suicide as farmer suicide, says Pardeshi. Farmer-activist Gajanan Amdabadkar of the Shetkari Sanghatana points out that suicide by women farmers whose farmlands are registered in their husbands’ names, young sons of farming families and by farmers who work on leased land have also been held for government aid under the existing eligible criteria. Farmers’ groups welcomed the relaxation in the criteria. But Kishor Tiwari of the Vidarbha Janandolan Samiti says suicide cases from 2006 instead of 2010 should be reviewed, so that families whose claims were rejected can get justice.